The Out Islands of the Bahamas consist of over 700 scarcely populated cays and islands boasting of pristine beauty, natural wonders, deserted beaches and quiet sanctuaries of wildlife. They are an amazing tropical vacation destination for individuals who look for something unique and desire an authentic off-the-beaten-path experience and activities. The Out Islands offer a captivating climate, an unparalleled collection of amazing beaches, best fishing, boating, sailing, bird-watching, best snorkeling, diving and ecotravel, unique culture born of African heritage and seafaring European adventures, and traditions that blend well to create a distinctly colorful and welcoming destination for tourists. Only 14 of the islands are inhabited and there are no high-rise hotels, cruise ships or crowds—just untainted scenery of tropical beauty that is tinged with marvelous shades of blue. The inhabited Out Islands are Abacos, Andros, Berry, Bimini, Eleuthera, Exumas, Long Island, Cat Island, Harbor Island, Inagua, Mayaguana, San Salvador, Acklins, and Crooked Islands. Here is a look at the Out Islands. If you feel like taking a trip to Costa Rica, do not forget to check out JungleVistaInn.com for a luxurious stay. Located in the northern part of Bahamas, 180 miles (290km) East of South Florida, the Abaco Islands are made up of the main islands of Little Abaco and Great Abaco, together with smaller barrier cays. The Islands consist of limestone and are marked on the ocean side by the 3rd largest barrier reef globally. The cays are mainly green with mangroves and boast of white-sand beaches. The cays of Abacos Island include Walker’s Cay and Grand Cay to the north, Spanish Cay, Green Turtle Cay, Great Guana Cay, Man-O-War Cay and Elbow Cay to the south, Lubbers Quarters and Tilloo Cay to the south while the western shore has Gorda Cay (now Castaway Cay). Moore’s Island is in the vicinity of Abacos. The Abacos are the most attractive of the Out Islands and draws the highest number of annual visitors, especially those who love fishing, diving, boating and great beaches. For instance, the Great Abaco Family Fitness weekend occurring every March in Treasure Cay attracts both local and international tourists with activities such as open water swimming, Olympic triathlons, sprints and children races. The Bahamas National Trust conserves 6 national parks on the Abacos Islands: the Abaco National Park, Fowl Cays National Reserve, Tilloo Cay National Reserve, Walker’s Cay National Reserve, Black Sound Cay National Reserve, and the Pelican Cay Land and Sea Park. The Marsh Harbor of the Big Island of Abaco is a commercial hub and the 3rd largest city in Bahamas. It hosts the Marsh Harbor Airport (MHH), which together with the Treasure Cay AirPort (TCB), serves the transport needs of inhabitants as well as connecting the cays to Florida. The cays are accessed by ferries, with the southern ones reached from the Marsh Harbor while ferries are also available between Treasure Cay and Marsh harbor and between Sandy Point and Nassau. Cars and boat rentals are available through https://ultimatetowncar.com/orlando-limo.php, but some cays also have rental boats, golf carts, bikes and scooters. Andros is the largest of the inhabited Out Islands of Bahamas. While a huge portion of the 2,300 square mile island is water in the form of channels, bights and creeks running through virgin forests of pine, mangrove and mahogany, the land area exhibits unique botanical and zoological diversity that makes it attractive for tourists. The land ecosystems of Andros include pineyard, hardwood coppice, saltwater march, sandy beaches, scrub, mangroves and palm savannas while the Tongue of the Ocean and the Barrier Reef, together with rocky tidal pools, estuaries and mangrove swamps offer superb breeding and growing habitats for unique marine lives, including humpback whales and turtle species such as leatherback, loggerhead, hawksbill and green. Andros has hundreds of bird species, including unique ones such as Bahama oriole, great lizard cuckoo, Bahama woodstar, Bahama yellowthroat, Bahama Swallow, Key West quail dove and West Indian whistling duck. Andros also has over 50 species of wild orchids, incredible blue holes and dozens of legendary creatures perpetuated by local lore. In spite of its small population, Andros has several commercial activities. The Western Air maintains the island’s headquarters in a modern facility located at San Andros Airport, the Mennonite mission-run farm produces a huge variety of commodities (sorghum, habanera peppers, potatoes, honey bee hives and fruits), Androsia (a handcrafted batik factory) produces colorful fabric that has become part of Bahamas national dress and identity, while GreenLife Growers (a native tree nursery) produces unique landscaping material for government projects and real estate developers. There is also a fledging conservation industry, a flourishing local handicraft industry and robust commercial fishing. Andros Island, Bahamas: A perfect place to relax and watch the sea. Tourism is the largest industry and biggest private employer on the Island. From Little Creek in the south to Nicholls Town in the north, there are over 35 hotels, guest houses, motels, resorts and lodges with roughly 400 rooms. Dive-dedicated resorts such as Small Hope Bay Lodge and Forfar’s Resort near Fresh Creek and North Blanket Sound respectively, offer unique diving activities that attract several tourists every year. Most of the tourists who visit Andros are scuba divers who are attracted by the splendor of the barrier reef (Tongue of the Ocean) and the Blue Holes, bone-fishing anglers and individuals looking for relaxation. Andros also has several festivals that attract tourists. The main festivals are Goombay and Junkanoo festivals between Christmas and New Year, Conch Festival, Annual Regatta at Morgan’s Bluff, Crabfest at Fresh Creek, Pirates’ Festival, Annual Seafood Splash and Chickcharnie Festival, and ANCAT ecologically-oriented events. 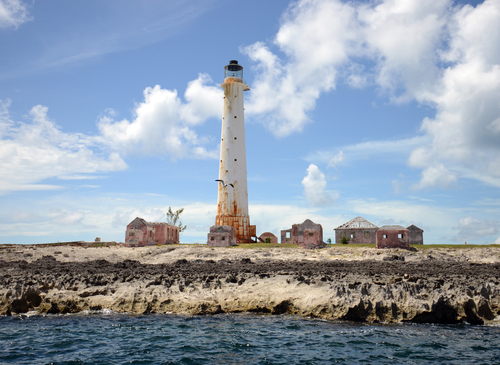 Great Isaac Cay Lighthouse in Bimini, Bahamas surrounded by abandoned homes on the coast. Bimini is Bahamas’ westernmost district. Located around 53 miles (81km) due East of Miami, Bimini is the closest area in the Bahamas to United States mainland. Primarily, Bimini has 3 islands: South Bimini, North Bimini and East Bimini. However, the Bimini district also include Cay Sal Bank. The main settlement of the island is Alice Town, an assortment of shops, bars and restaurants found on a road called the “King’s Highway”. The second largest road, the Queens Highway, runs the length of the island parallel to the Kings Highway. 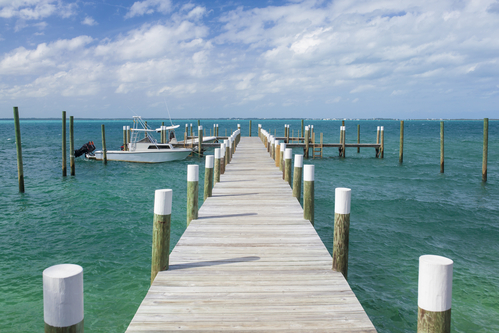 South Bimini hosts the South Bimini Airport and provides a quiet alternative to North Bimini’s slow bustle. For tourists, Bimini offers a unique fishing stroll on the beach for blue-water monsters, splendid diving thrills in the oceanic river, and spectacular snorkeling with wild-spotted dolphins. There are also several animal species to sample in Bimini, including the Boa (a terrestrial reptile), Ameiva (a fast-moving lizard) and the Smalltooth sawfish (one of the rarest fish species in the world). Bimini island is also home to sharks of different kinds, including the Mako sharks, Bigeye Thresher sharks, Spiny dogfish and Sixgill, which tourists can see as they go around the island or visit the Bimini Biological Field Station. The shark lab owned by shark biologist, Dr. Samuel Gruber, is located in South Bimini and offers marine internship opportunities for individuals interested in shark research and ocean ecosystem conservation. Tourists can also visit the Compleat Angler, which was Hemingway’s favorite bar and hotel, sample Bimini’s mystical side by visiting the Fountain of Youth (the Healing Hole), a famed lithium-emitting tidal spring located amid mangroves, visit marina hotels, or tour the Bimini Road (a 600-foot-long stretch of stones that some psychics have claimed to be evidence of Atlantis). A final favorite is the Great Isaac Cay Lighthouse, which is only accessible by a 45 minute boat ride. Located in central Bahamas, Cat Island is a small district with a population of just over 1,530 people (2010 Census) and divided into the 6 main settlements of Orange Creek, Arthur’s Town, Old Bright, Devil’s Point, New Bright and Port Howe. The island hosts Bahamas’ highest point, the Mt Alvernia Hermitage of the 206ft Mount Alvernia (Como Hill). At the peak of the mountain is a small monastery constructed by architect-hermit, Father Jerome, which is a sight worth the trek up the steep incline. Tourists to Cat island may also take pleasure in Armbrister Creek as it flows into the Boiling Hole (Boiling Point), a clear lake whose tidal conditions results in burps and bubbles and which acts as a great place to spy baby sharks and numerous birds that nest on its mangrove fringes. Another breathtaking lake, the Mermaid Hole, located in Bain Town attracts tourists through a local lore that paints it as the dwelling place of a mermaid. It has 4 bed holes and underground passageways and caverns. Similarly, the Big Blue Hole located at Dickies Road near Orange Creek is a big tourist attraction site because of local folklore that a monster once lived inside it. The hole is quite deep and has strong undercurrents that flow into the sea. Equally, the beautifully crafted St. Francis of Assisi Catholic Church located in Old Bright enthralls tourists with its amazing engravings, sculptures and frescos. Besides, visits to the ruins of Deveaux House Mansion in Port Howe, to the Columbus World Center Museum in Knowles or to South Bright’s Academy Award Winner (the childhood home of Sir Sidney Poitier), give tourists unforgettable experiences. This southernmost district of Bahamas comprises of Little Inagua and Great Inagua. Great Inagua is 596 square miles (1544 sq. km) in size and is the 3rd largest island in Bahamas. It encloses numerous lakes, the most notable being Lake Windsor (also known as Lake Rosa), which occupies almost a quarter of the island. Great Inagua hosts Mathew Town, the capital and only harbor of the island; Morton salt Company, the second largest solar saline in North America; and Great Inagua Airport (GIA). At the center of Great Inagua is a spectacular bird sanctuary with over 80,000 West Indian flamingoes and several bird species such as Inagua woodstar, Bahama parrot, American kestrel, reddish egret and brown pelican. Little Inagua lies to the northeast of Great Inagua, is 30 sq. miles (78km sq.) in size and is uninhabited. It is occupied by herds of feral donkeys, goats and a large Land and Sea Park. Named after its original settlers, the Eleutheran Adventurers (a group that sought for religious freedom), Eleuthera is an island of quant settlements (such as Hatchet Bay, Bannerman Town and Tarpum Bay) and offers a superb experience for adventurers seeking for caves to investigate, waves to surf, reefs to explore and fish to catch. The long and thin island lies 50 miles (80km) East of Nassau and boasts of a variety of topographical features including large protrusions of ancient coral reefs and wide rolling sand beaches. It faces the Atlantic Ocean to the east and the Great Bahama Bank to the west. It has 3 airports (Governor’s Harbor airport, Rock Sound airport and North Eleuthera Airport), the USA Naval Facility (NAVFAC) and the US Air Force Eastern Test Range auxiliary air force base (AAFB). Visitors to the island enjoy passing time at the pink-sand beach of Harbor Island (located at the north end of Eleuthera), relish the taste of fresh pineapples and fruit-enriched tarts, and spend their time in some of the finest boutique hotels. Glass window bridge on Eleuthera island Bahamas, where you can see both the Deep Blue Atlantic Ocean and the turquoise blue of the Caribbean Sea. Exuma district of Bahamas consists of 365 cays. The largest cay, Great Exuma, which is 37 miles (60km) long acts as the primary base for exploring the other cays. From this cay, the others cays appear as a myriad of smaller and exquisite dolls patched on water to present tourists with an exciting fantasyland of pristine beaches, secluded coves and luxuriant reefs. The Exuma cays lie north of the Great Exuma and form a 22-mile stretch making up the Exuma Cays Land and Sea Park, which is accessible by seaplane or a boat from Staniel Cay. The park has amazing hiking trails, blue holes, beaches and miles of reef for diving and snorkeling. The Great Exuma Cay and other cays have several attractions, including excellent bonefishing, diving, sailing, rowing, festivals and the celebrated Out Island Regatta. Exuma International Airport links George Town city directly from Miami, Nassau, Toronto and Atlanta, while a small airstrip on Staniel Cay also boosts transportation. Apart from the pristine beaches, clear aquamarine-colored water and exciting culture, Exumas also offers fresh delicacies that make it a wonderful luxury travel destination. Accommodations range from ocean-view cottages near Stocking Island to the bustling Peace & Plenty Bonefish Lodge patched on a mangrove creek. Comprising of a group of cays semi-circling a huge shallow lagoon known as the Bright of Acklins, Acklins and Crooked Islands are a meshwork of magnificent beaches and gorgeous reefs. The major cays forming the islands are Crooked Island to the north and Acklins to the south-east, Castle Island to the south and Long Cay (Fortune Island) to the north-west. The cays were settled by American Loyalists who owned cotton plantations until the 1780s, but the abolition of slavery rendered the plantations uneconomical and resulted in a shift to small-scale farming and fishing. Berry district of Bahamas consists of a chain of cays that cover about 30 sq. miles (78km sq.) on the northwestern section of the Out Islands. The major islands of Berry include Great Harbor Cay, Chub Cay, Little Stirrup Cay, Great stirrup Cay, Cistern Cay and Little whale cay. Berry islands are relatively undeveloped, having no major hotels, airport and other amenities as most of the cays are either uninhabited or owned by a single wealthy individual as a second home. The islands are visited mostly during winter seasons by out-of-town visitors and second-home residents and are primarily attractive as a destination for big game fishing, snorkeling, scuba diving and annual fishing tournaments. Known as the most scenic island in Bahamas, Long Island has an impeccably interesting coastline, steep rocky headlands, broad white soft-sand beaches and exquisite caves. The western side of the island rises gently above the sea to form mangrove-coated shoreline and soft beaches while the eastern side facing the pounding of Atlantic is bordered by pure limestone crags. There are dramatic, stark-white cliffs, small bays and inlets (like the New Found Harbor), and smaller offshore cays (like Sandy Cay). The Island’s main tourist center, Stella Maria, is a sprawling, residential development and self-contained resort with its airline and airport, together with diving and fishing fleets. The main opportunities for tourists include scuba diving, sailing, fishing, snorkeling, free-diving and beach relaxation. Named San Salvador by Christopher Columbus after Christ the Savior, the island is one of the districts of Bahamas with great tourist attractions. Its sandy beaches, shallow-water reefs and quick drops in submerged island platform make it ideal for scuba diving and snorkeling. Inhabited by just over 1,200 people, the island is ideal for tourists who want to enjoy quiet vacations in breathtaking settings. Apart from beaches, tourists are attracted to the island by its numerous monuments, shipwrecks and ruins. The main areas that tourists visit include Gerace Research Center (center for archeology, biology and geology research), Dixon Hill lighthouse, and Pleistocene Cockburn Town Fossil Reef. The major community and seat of the local government of the island is Cockburn Town and just a few miles to the north of town is Club Med resort (Columbus Isle), a crucial tourist destination in San Salvador Island. Geographically the most easterly district and island of Bahamas, Mayaguana is one of the few Bahamian islands that have retained their Lucayan names. Because it is located 100km north of Great Inagua and 560km southeast of Nassau, the island lies at halfway point between Puerto Rico and South Florida. Hence, it is a popular stopover for boats on a direct route to eastern Caribbean. Large areas of Mayaguana are uninhabited, especially the Northeast Point, Upper Point and Southeast Point which are predominantly inaccessible by road. In fact, the district is considered the most isolated island in Bahamas with mail boats still being used as the primary form of communication. Equally, Mayaguana is among the least visited Out Islands of Bahamas because of lack of proper infrastructure. However, those who visit the island are attracted by opportunities for bonefishing, scuba diving, snorkeling, duck hunting, off-trail bikers and ecotourism. If you decide to sail to Bahamas at your own boat, make sure you visit the Merritt Supply website before your trip. It is possible to get all sorts of top quality marine supplies for your safe trip.